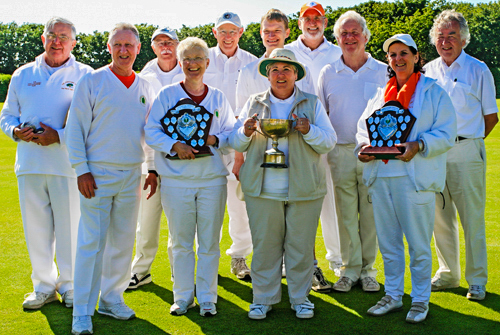 Bowdon win NW Fed Club Championship at Southport (29/06/08) by Tony Thomas. Over 100 competitors in twenty three teams took part in this annual NW Fed Croquet tournament. This is the only Croquet tournament in the UK where players and clubs come together to contest Croquet in all disciplines. The organisation, management and catering were excellent. The South Lawns playing really well and the North Lawns providing their greatest challenge yet with a speed of minus something Plummers. Add to the mix the Southport weather of sun, rain, wind and more sun to provide a convivial croquet atmosphere. Crake Valley won the Advanced section, Bowdon the Handicap and the Golf, Pendle the Short. On aggregating all the points, Bowdon were crowned 2008 Festival Champions.